What if I said the following, “you will never need to use the angular dimension again when creating rotation parameters in families” would you believe me? 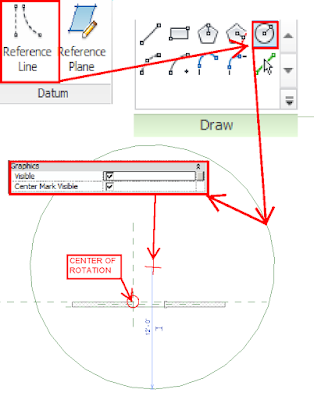 I have found two alternative methods to create rotation parameters that do not use the angular dimension. Why did I create these two methods? The answer is simple, the need for stability. The traditional method, shown in the rig above, uses the angular dimension command. It is not a secret that it is unstable when it is at a zero value and breaks most of the time at other angles. Because of this, I have created two methods that completely avoid this unstable dimension. 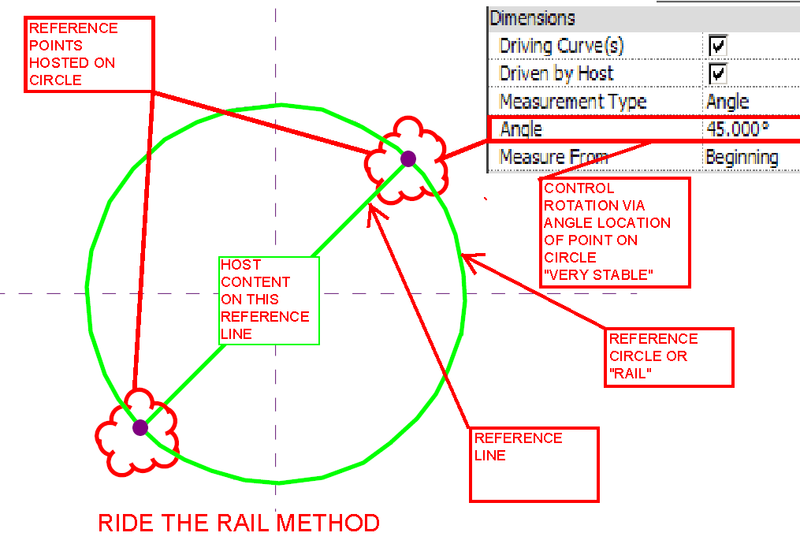 It’s called “Ride the Rail” method for use in the mass and adaptive component family environment and “open reference circle” method for use in the classic family environment. 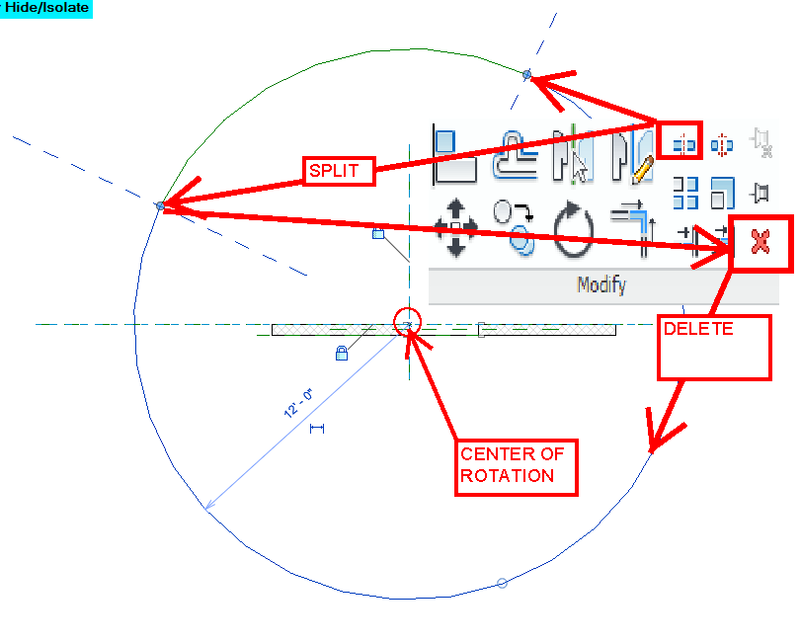 I have already showed these two methods at the Los Angeles Revit User Group (LARUG) and the BIM Users Group Inland Empire (BUGIE) in the month of April 2012. 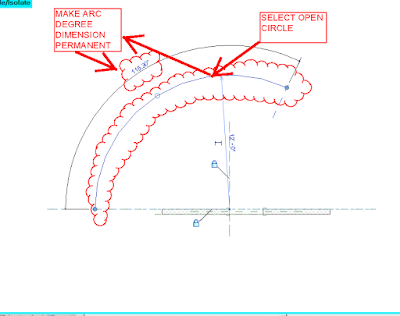 These methods will also be shown in the two classes I am teaching at the Revit Technology Conference in Australia in May and at the Revit Technology Conference in Atlanta, GA, USA in June. 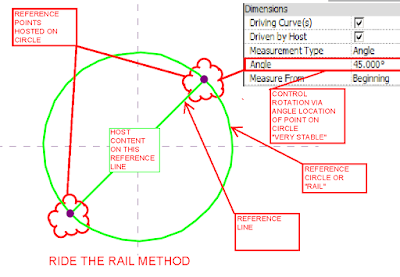 I created the “Ride the Rail” method as a solution to a challenge at the Los Angeles Revit User Group Meeting where members could submit Revit challenges. Read all about the history of Ride the Rail method here thanks Jay Zallan. 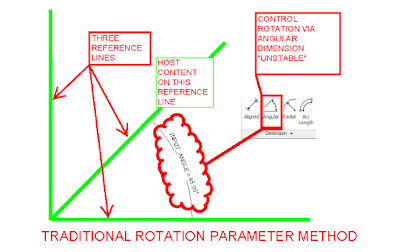 As shown above in the rotation rig, the Ride the Rail method does not use the angular dimension to control the angle of the hosting reference line hence it is extremely stable. 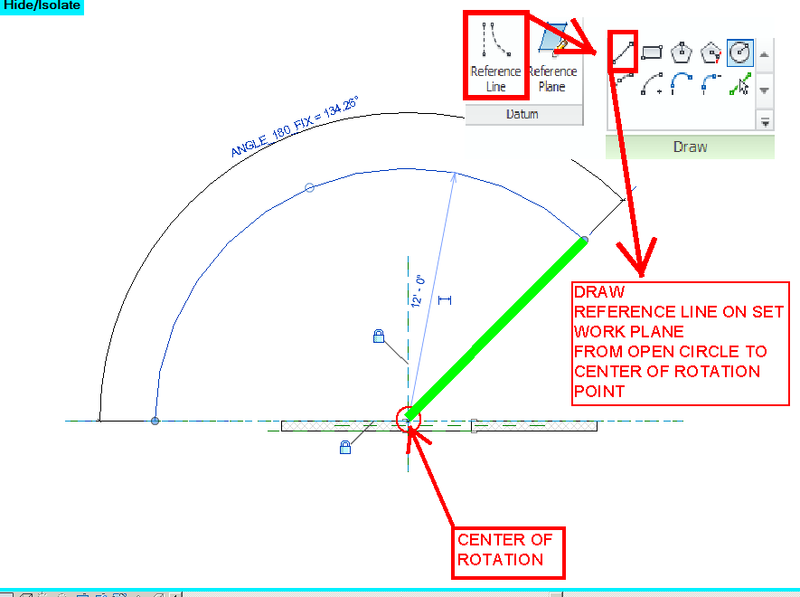 It uses the power of the reference point to “ride” the “rail” of the circle or curve to control the angle. There is only one major drawback from this extremely stable method. Since it uses the power of the reference point, it is only able to be used in the mass family environment or the adaptive component family environment because all other environments do not have reference points. 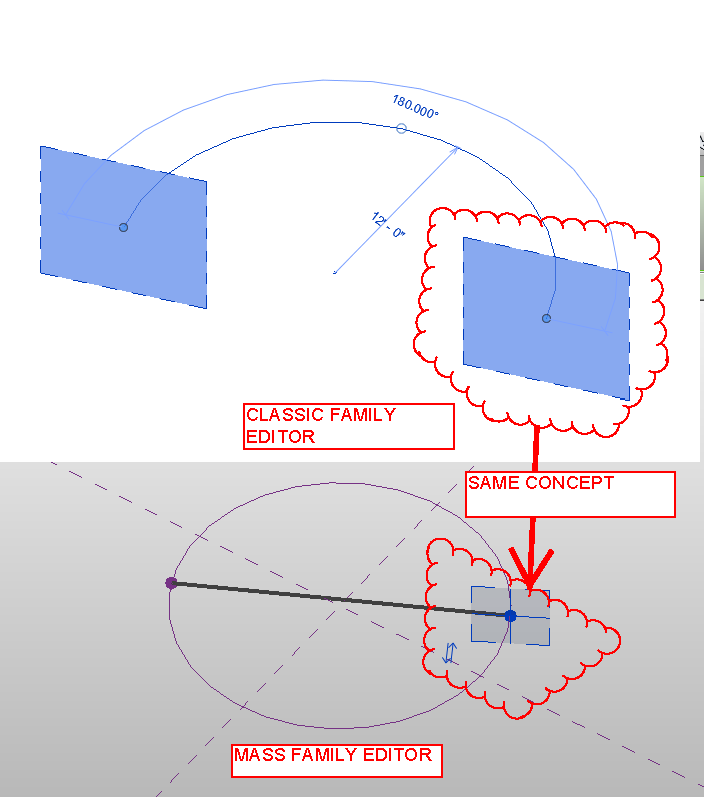 This was very troubling to me and so I decided to create a rotation rig/method that could be used in any family, classic, mass, and project environment. I realized that the whole concept of ride the rail method was based not on the point but the reference plane of the point. 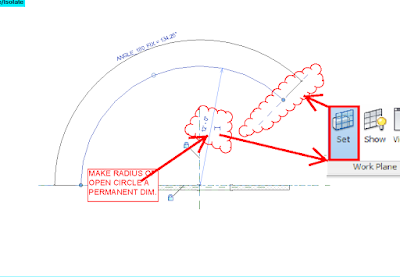 I then made the connection…open up the circle and host the reference line on the reference plane at the end of the open reference circle. 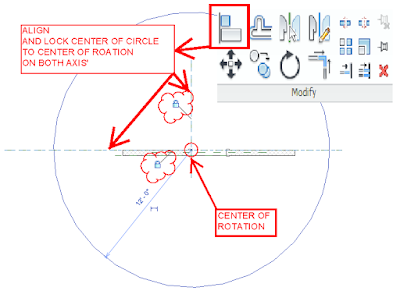 From this, I created the “open reference circle” rotation method as shown in the rotation rig above and notice that it uses the arc angle of the open circle to control the angle NOT the angle parameter. 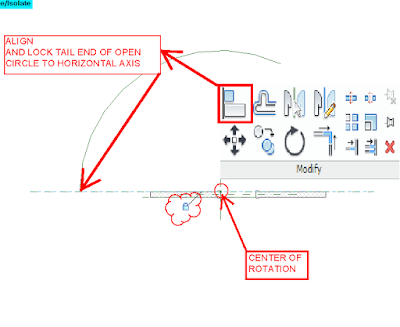 Below is a step by step process on how to create the open reference circle rig to control rotation for a door family in Revit. Of course this method could be used to a rig that could then be used to rotate anything. 3. Turn on the center of the circle mark. Developers please turn it on by default. 10. Select the open circle. 11. 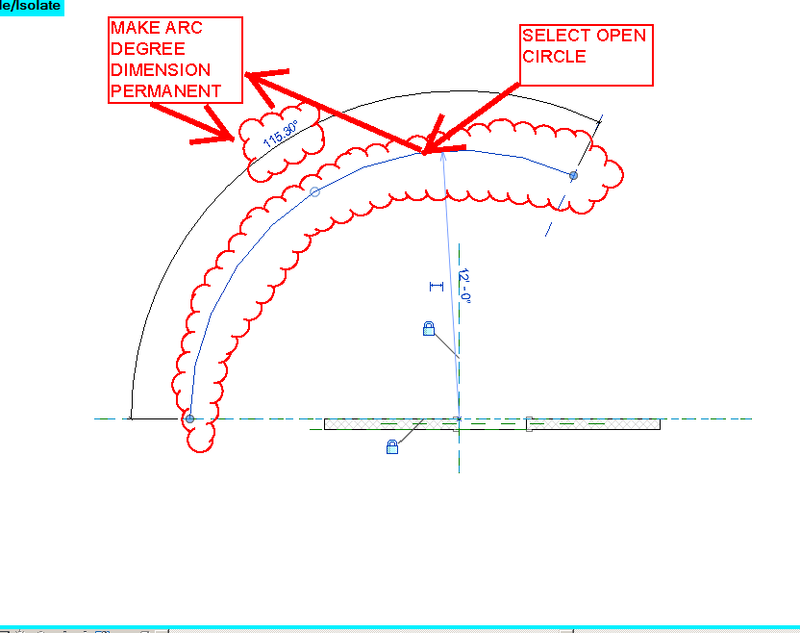 Note that when the open circle/arc is selected a very very very interesting element pops up that is not available anywhere else in Revit…..the arc degree dimension! 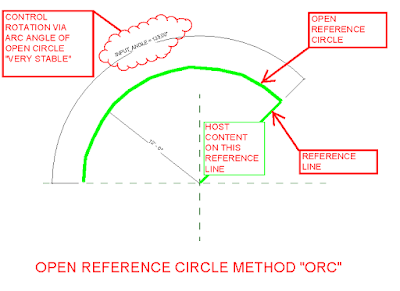 It is this phenomenon that I took advantage of in order for the open reference circle method to work. 14. 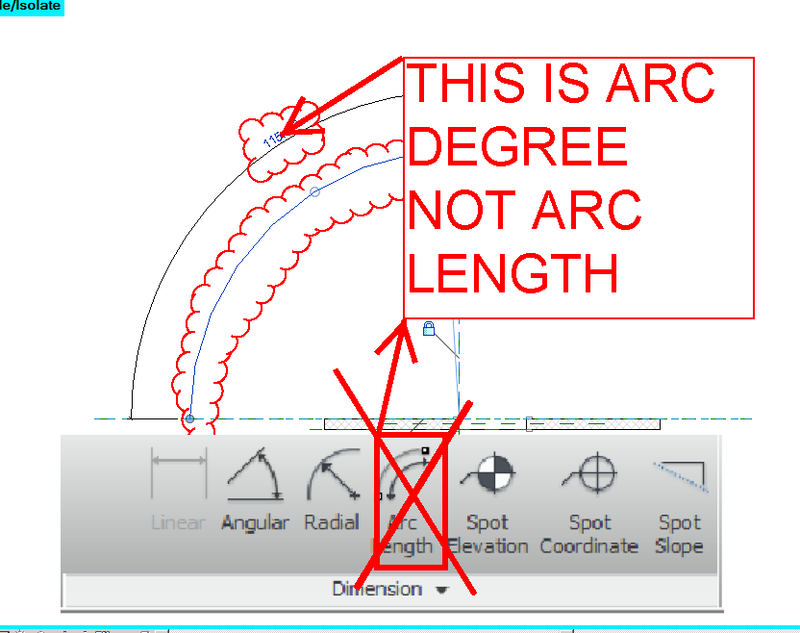 As shown above, do not get the arc angle and arc length confused. They are two completely difference dimensions. 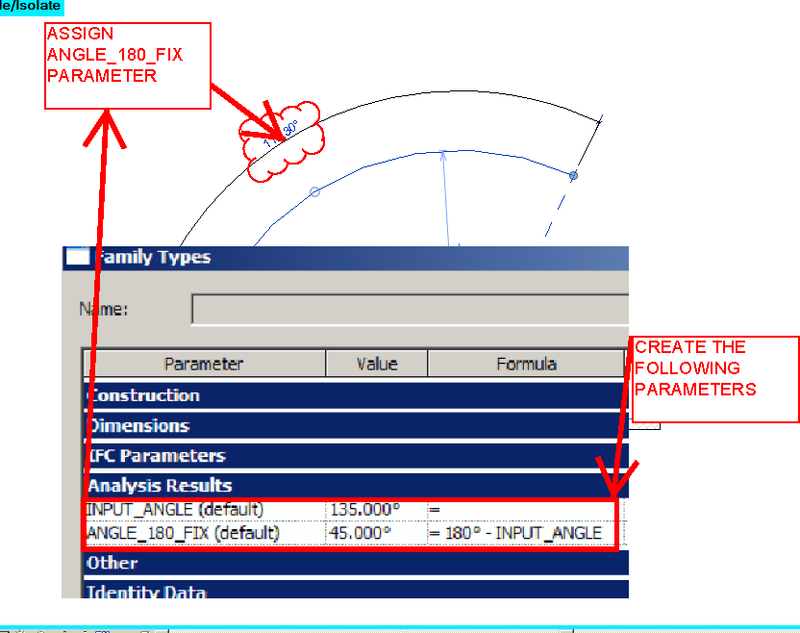 The difference is that the arc angle is able to be converted to a parameter that is CHANGEABLE. In contrast to the arch length, the arch length is a reporting parameter only, meaning it is only able to “show” the length value and not able to be changed. b. It is also very critical that it is done at this step and not any other time. 18. 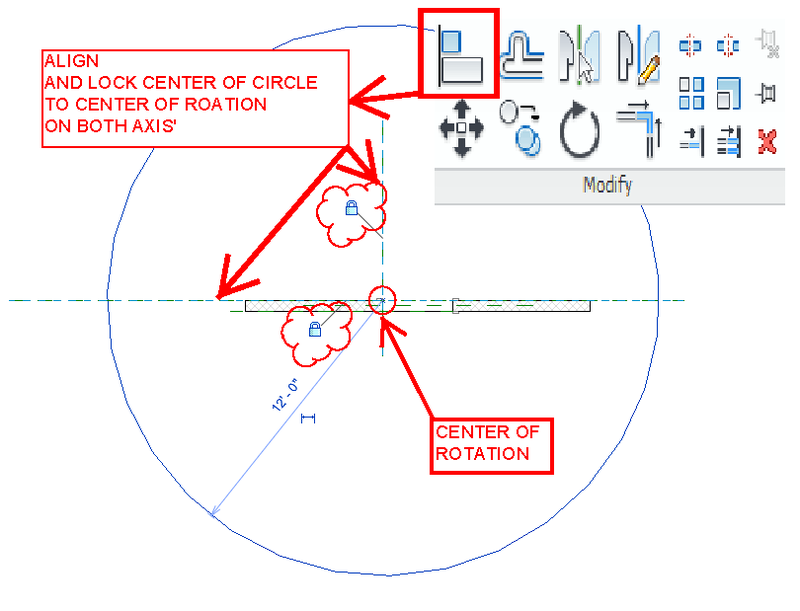 Set the work plane to the end of the open circle, this is done so that the reference line that will host the door geometry is placed at the correct plane. 19. 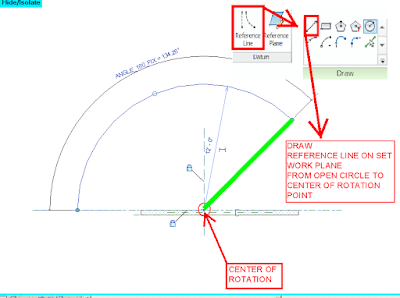 Draw a reference line on the set work plane from the open circle end to the center of rotation of the open circle. 20. Congratulations! 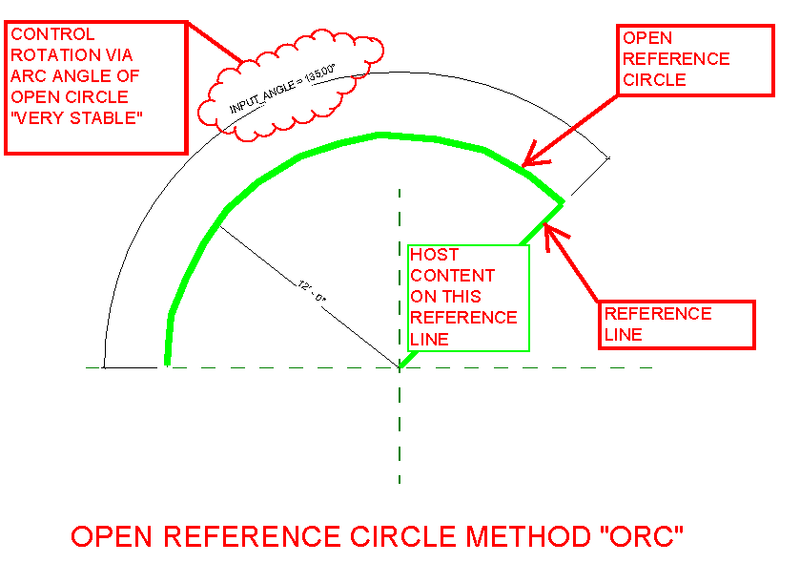 The open reference circle rotation rig is now complete. 21. 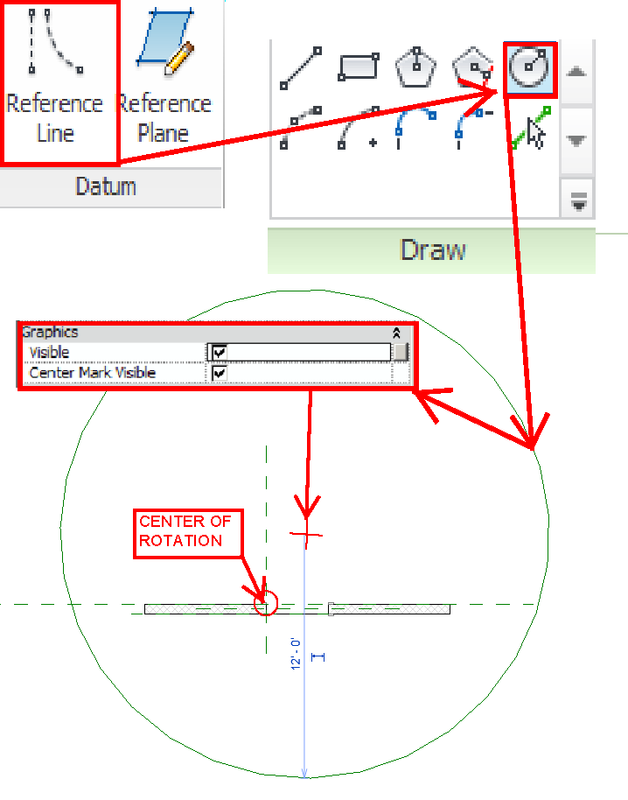 Set the reference plane of the host reference line to receive the door geometry, create the door geometry on the hosting reference line. 22. How to create the door geometry will not be covered in this posting however, it is very simple to perform. 23. The following shows the rig in action in the door family and in the project environment. 24.The door family was covered here however; this method is applicable to host any geometry, in any family, in any environment. 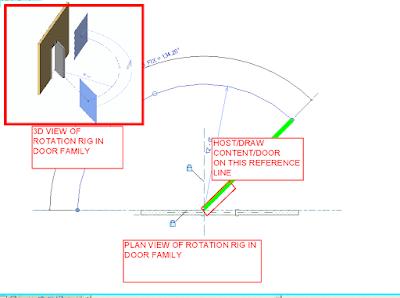 Above is the example Door family at different angles that are hosted on a wall element in the project environment that is using the open reference circle rotation rig. Interesting. However, there seems to be an issue. 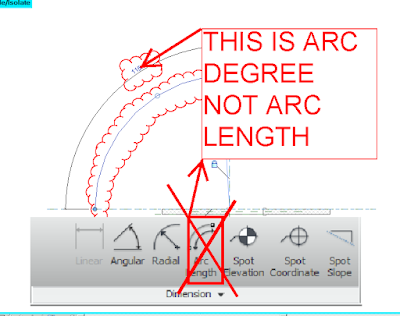 Since the parameter that controls the angle of the arc is also determining its length, indirectly, this method will break if the user enters 180 or 360, because at 180 there won't be any arc to do, and Revit will issue the "line is too short" error. It will also break if the user enters 360. It could be fixed, but that requires more work on the formula. Also, I don't agree that the other method is "unstable when it is at a zero value and breaks most of the time at other angles." That is simply not true. The other method, with only one parameter and one line, can rotate an element all the way around without breaking at any angle, not even at 0, 180, or 360. Having said that, this method is an alternative, not necessarily an replacement or an improvement over the other method, since this one takes more steps to do, anyway, and the reason that you have provided about the "instability" of the other method is not true. 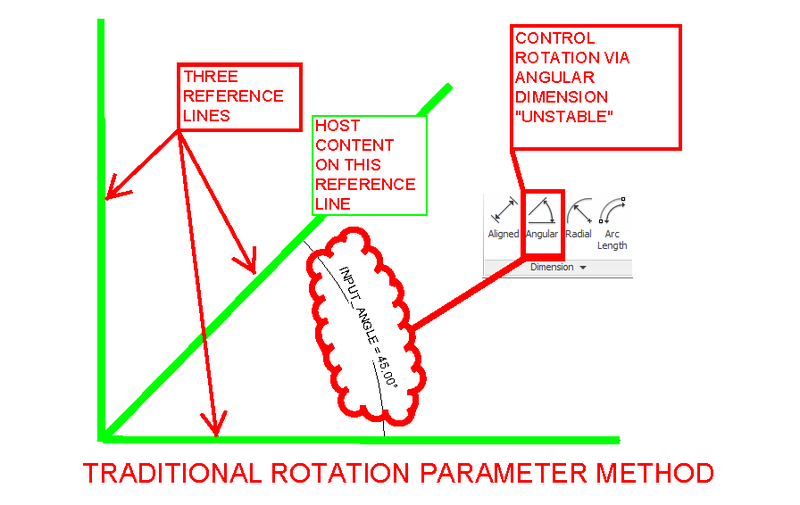 The blog article begins with this statement in capital letters: "YOU NEVER NEED TO USE THE ANGULAR DIMENSION AGAIN WHEN CREATING ROTATION PARAMETERS IN FAMILIES", and it says that the other method "is unstable when it is at a zero value and breaks most of the time at other angles." Both statements are misleading. That is my point. I am not being harsh. I am just pointing out what is true and what is not. 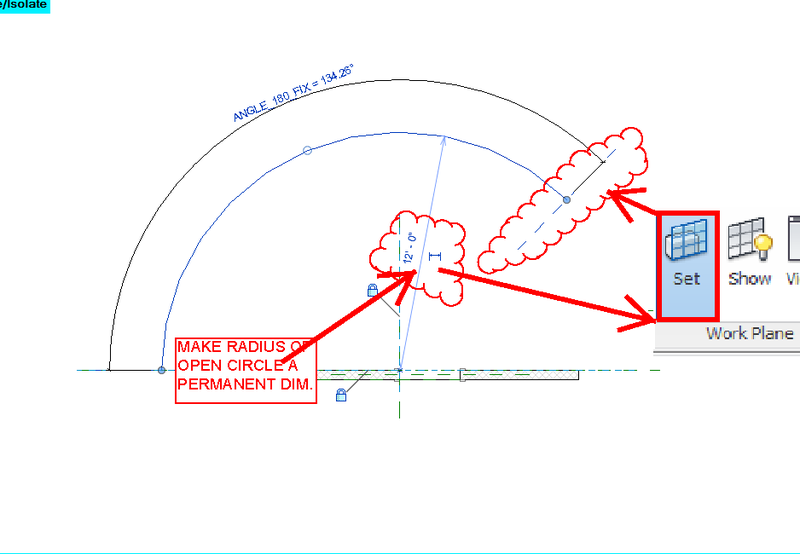 You are correct that it's usefulness is a bit overstated but it is a wonderful method and uses some 'hidden' Revit functionality (the hidden, radial angle dimension), I guess "never" was a bit over the top!!! I modified my comments to reflect my view better and think that we can let the post stand on it's own...Obviously it generates conversation and that is always good!!! Doors cannot open to 180 degrees with the normal hinge setup, that this method is applied to... there are handles on doors, therefore "in reality" these doors should only open to approx. 178 degrees maximum. We did speak to this at the LARUG and noted that if an offset hinge, such as Rixon hinges are used a different method would be appropriate. 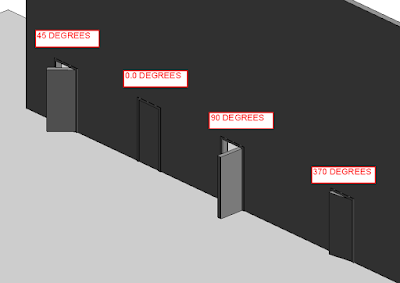 There are always different needs for different objects and designs, but this method is not only useful for doors, that is just a simple way to teach and explain that there are different methods possible... I might also add that this method is one that nobody in Revitland, at least as far as I have seen has come up with. This method is yet another tool in one's cache and it's a very creative & newly found solution, so while it may overstate it's use the post & method are a valid new option. BTW: The quote about "...always..." was posed as a question...we obviously are being challenged to find out when and where it's appropriate!!! Yes, the method is useful and it is a valid alternative. Not a replacement, though. 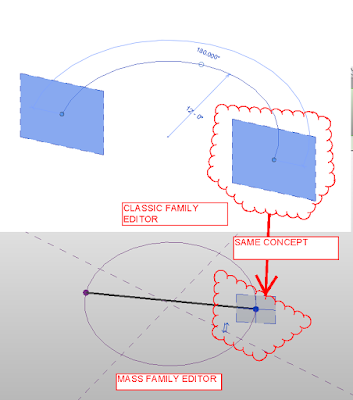 And, about the angles, I was not referring to doors in particular, but about the usage of this method for rotating any other element in the standard family editor, as proposed in the blog article. I see some limitations that the other method does not have. It might be much more useful in the conceptual design environment. Ahh I get it...Stay tuned there is a slight modification coming that allows this method to swing to any angle from 0 to 360 degrees and doesn't break!!! I tried your technique but keep getting a “Constraints are not satisfied” error. See capture at http://screencast.com/t/vAmrdWKJMn25 What am I doing wrong? 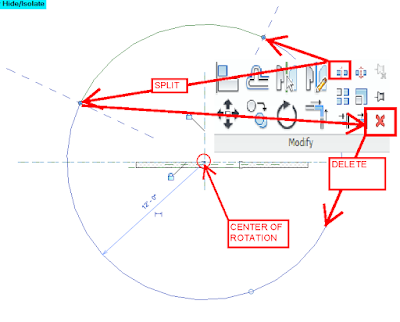 I did lock the center if the circle to the reference planes as you described in the article prior to cutting the circle to make it open. It unlocks the endpoint lock when I try adjusting the angle.